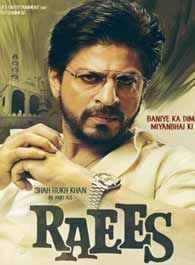 Raees is a 2017 Indian action crime thriller film directed by Rahul Dholakia and produced by Gauri Khan, Ritesh Sidhwani and Farhan Akhtar under their banners Red Chillies Entertainment and Excel Entertainment. It stars Shah Rukh Khan, Mahira Khan and Nawazuddin Siddiqui. Waiting for the movie... Would be great.. Waiting for Raees eagerly for u SRK.